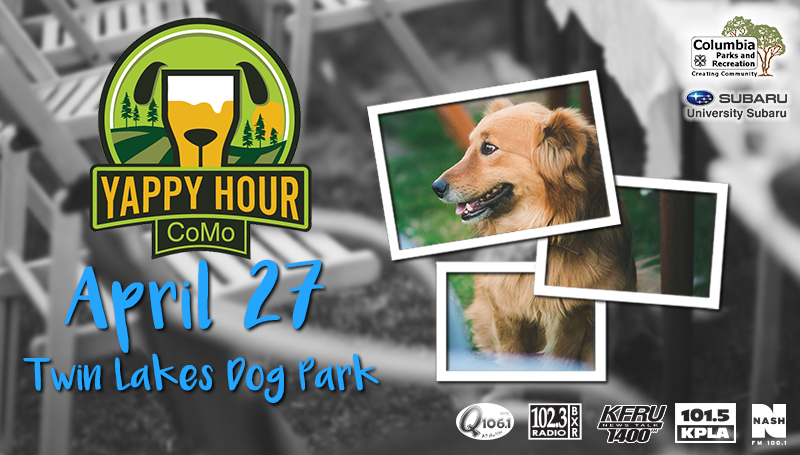 Food trucks, live music, craft beer, and room for Fido to roam – all at this year’s Yappy Hour on April 27th from 3-6p at Twin Lakes Recreation Area. This event will feature dog related booths, activities, contests, an adoptable dog pageant, and more. This event is coordinated with the help of MU Department of Parks, Recreation and Sport students, Q 106.1, BXR, KPLA, KFRU, NASH FM 100.1, and Columbia Parks & Recreation. This event is sponsored by University Subaru. $10 Yappy Hour Dog Registration (includes pooch admission + 1 Human) – includes Doggy Goody Bag and one (1) drink voucher good for alcoholic or non-alcoholic drink. $5 “People-Only” Registration – for those not bringing a dog or accompanying a person/dog pair who have signed up. Includes admission only. Limit one dog per person and all dogs must be on a fixed length leash (no retractable leashes). Must be 16 years or older to attend and 21+ to drink (we will be carding at the door). All dogs must be up-to-date on vaccines. Parking is limited, so walking from Forum Nature Area or Scott Blvd. trailheads is encouraged. Doggy bag and drink voucher is included with the $10 pre-registration. Registration at the door is $5 per person or pooch.